← WriterStrong: Is Your Dialog Doing Double Duty? We’ve talked about it in other posts. How learning your writing process is finding your way in a pitch black room, full of furniture. You can learn by barking your shins, but there are less painful ways. Hopefully, this post will help. I’m an organized person, so it would make me crazy trying to locate details in my WIP. Which chapter did the dog first show up? Or the first kiss? Or harder yet, the smaller details – what kind of shoes did the old man wear the second time the heroine met him? I’d end up scrolling through two hundred pages. And get distracted. Oh, now there’s a clunky sentence. Wait, did I really use the word ‘jerk’ twenty-three times in this book? Before you know it, I’d be hopelessly mired in the text, and forgot what I came for. I’m an accountant by trade (well, I used to be – Ah, retirement) so if I need something organized, of course, the first place I go is Excel. I know all you math-adverse readers have now broken into a sweat. Follow me here – no formulas are involved. Promise. Track the romance, and where it happened. If it’s too small to read, click on it and view it full-size. Red was problem scenes I knew I’d have to come back to later. The far right column is a timeline – because I stink at them. Note that I have more than one sheet to this workbook. You can use them for a more detailed timeline, or anything else you’d like to track. Revisions usually means cutting and pasting scenes in different places, so I’ll create a new sheet for my newly revised version. Honestly, the Cheat Sheet has been invaluable for me. It gives me a bird’s eye view of the entire novel on one screen. I can’t imagine writing a book without one. Hope it helps save your shins! What do you use to organize your WIP? Any suggestions for us? This entry was posted in Craft, Miscellaneous and tagged Excel for writers, Laura Drake, novel writing, organizing, Road Song, writing. Bookmark the permalink. This is positively inspired! Now, mmm, how exactly does Excel work? Using Excel as a miniature database like this is pretty easy if you jump in and play around. Google Drive (which replaced the old Google Docs) has a free spreadsheet tool which has virtually all Excel’s useful features. Search for “google drive spreadsheet” and you can get a free account, and play around all you want. Because they’re available from any computer, yet secured by passwords, I prefer Google’s online versions to the local copy of MS Office on my laptop. Thanks a million Joel for this. It sounds like even a technophobe like me might be able to manage it. Hi Laura, What a fabulous idea!! I love Excel- why didn’t I think of this? hehehe. Thanks for the idea! Let me know if you come up with other things you want to track, Susan. I know there must be a bunch I’m not tracking. Susan and C. Hope – yeah, don’t you love when that happens?! I hesitated to write about this – I always assume if I know it, everyone knows it. Glad I was wrong this time, and that it helped! Hey, Laura. Interesting, spreadsheet you’ve got. I’ve tried using something like this before, but find excell a bit of a pain to deal with. (Something to do with operator error, I’m sure. Also, I need more words than I have space for LOL) But I took the concept and put it in a plain old table. I show chapter, scenes, POV, page from 1-16 or whatever, and the time. I have 6 scenes across and usually Scenes 7-12 can fit all on one page. If I have to move a scene to some place else in the book, it’s easy to clip and paste. If I’ve lopped over in saying what is going on, I print on the back, so I’ve got info on one chapter on one sheet. Notice the word “Print.” I always make a print copy, even though changes happen. I love your color coding, Laura, showing the romance part. I need to find a way to incorporate that into my charts showing the romance and the suspense. Thanks for sharing. Great, Marsha – yours sounds interesting, but I’m better with Excel than Word! Oh wait, no one tell my editor, okay? Heck no, Florence – if you don’t think it will help, or if it’s going to make you sweat to open Excel, don’t use it! Sounds like you have a good system. Laura…I LOVE this! I use Excel to keep track of my daily writing, but then do the whole search and get distracted thing when I’m looking for a certain scene. I’ll definitely be revising my spreadsheet to incorporate chapter content and length of each chapter. Thank you so much for sharing. Hey, this gig is hard! We need to share the crackle-sauce, Ruthie! I hate that getting distracted thing it’s — hey, didn’t I need to send an email to . . . 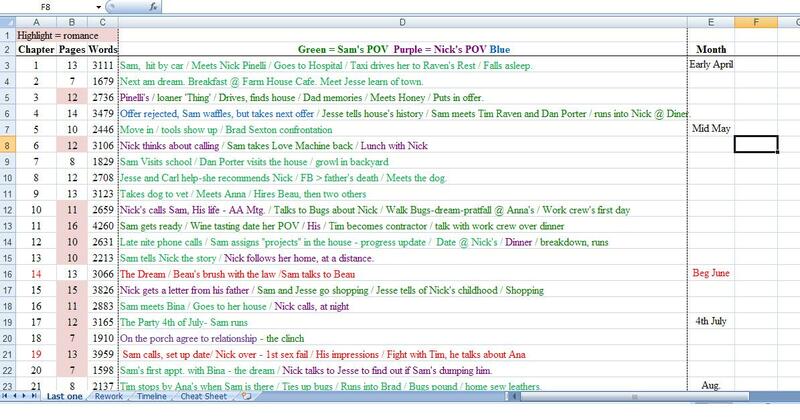 I have a similar worksheet, but use a separate column for POV rather than messing with colours and a separate column for the scene’s main event and it’s outcome. I use a separate worksheet for my GIAM word count. And another for who’s done what by way of critique and beta. I could go on. I’ve looked at Scrivener but it just doesn’t have the flexibility of a DIY Excel workbook. Joan, so you must have each scene on a separate line, right? I want to try Scrivener, but I’m too busy writing to learn it! When you find something that works, I say, use it! Now, if I could just find as good a tool for plotting…oh. That would mean I’d need to plot. Never mind. Yes, one line for each scene, all nicely numbered, just like yours. Excel is a great tool for plotting. I put in scene ideas in logical groups for main plot and subplot, then shuffle everything around until I have a nice twisty story. I update as I go along, so at the end of it all, I have a synopsis! Ta da! Ohmigosh…this organized plotter is hanging her head in shame. Ok, Laura. you blow my organizational chart out of the water. But I love yours! Gonna “favorite” this post and come back when i start my next manuscript. Or email me, Kerry, I’ll send you the sheet itself! I’ve used Excel in the past to track times of day, who’s introduced when, what clues are dropped, etc. I also had an excel character sheet to remind me of last names, character traits, and physical appearance. For my current novel, however, I’ve moved to a lower tech note book. We’ll see if my plot is strong enough not to fiddle with too much! KW – I plot with paper too. Since I’m a pantster, I do this as I go along. I read a blog this morning, that calls this a “God’s Eye View” of a novel. I really like that! Wow, Nancy, my hat’s off to you – and Fae Rowen, and everyone else who creates new worlds for readers to discover. I can’t even plot, much less create a whole new world! Hope this helps separate the flora from the fauna for you. As a dive-in-without-the-safety-fins pantster, I get through my first draft then create an excel sheet very similar to this before starting revisions. I’ll skim through my first draft and fill in details for each chapter – what characters have come out to play, what the setting is, timeframe, plots/subplots, and then what I think is missing. That gives me a good overall look at what I have and what I need to do with my revisions. Me too, Orly – except I write mine as I go. I finish a chapter, then add what happened, etc. to the Excel sheet. I always think I won’t forget things….who am I kidding? I forget my grandkid’s names for cripes sake! Love this idea! Thanks for sharing. I also look at things using Outline View in MS Word a lot. My chapter headings are a small summary of what the chapter contains, so I get a snapshot of the overall book just by switching to Outline View. Oh, what a clever idea! I just pulled mine up in outline view, and I see how that could work. You’d have to clean all that up though, before you submit, right? What a great idea. As a neuroscience geek and writer, you use both the left (analytic) and right (creative) sides if your brain. And to great effect. I am in the process of learning Scrivener and am wondering if it comes even close to this. You’ve covered all of the basis, Laura. Thank you! Thanks, Lee, glad to hear I’m using the last remaining lynchpin braincells I have left! Wow, neuroscience…you and I could hang at the local geek convention! Power to the geeks! Thanks Marilyn! Yeah, I always think I’m not going to forget the details, but hey, who am I kidding? I can’t remember my grandkid’s names, half the time. Great idea! I use Scrivener, and I really like their index cards feature. You can put a couple sentences on a card, and physically “move” them around and see everything at a glance. Stop it, you two. I’m dying to try Scrivener, but I don’t, for the same reason I’m not on Pinterest. I don’t have time!!! Stop with the ‘S’ word! It’s too tempting. What a fantastic idea! I’m off to make my own version right now! What a relief! I thought I was the only one using my finely honed nerd skill as a writer! I do something similiar, Laura. But I have a row for each scene within the chapter, and have a POV column (so I can sort by POV and make sure it weighs heavier on the main POV I am trying to show). I also have a column for location time/day/week to make sure I’m staying chronological. During edits, when I need to hop back to any scene to double check something, this has been well-worth the extra work. Thanks, Sharon. I love all parts of this, but my most recent addition is the column for timeline. Something about time in a novel flummoxes me. In some weird, twisted way, it’s like reading a map (which I cannot do) or Geometry (I flunked.) Makes no sense, but there it is. I’m trying to keep it fluid, and add things as they occur to me. this is brilliant! Thank you! I really needed this! I have tried a couple free “writing” programs and just am not thrilled with them. This is something that will be invaluable to me. You are incredible. Awesome, Nena – glad it can help you! Oh yeah, Susan, Lotus! Remember how excited we were to have that?! Oh, very cool, Richard! Thanks for the tip – going there now. I use some of these components, but in a Word doc. I had not thought of using it in Excel. Thanks for the suggestions & example. That’s the cool thing, Melissa, you don’t have to! post an email to the group with your email address, and I’ll send you my blank Excel file! Then you just type in the boxes. I love this idea! It’s totally perfect for people like me who love to have a plan and chart for everything. 🙂 So glad I stopped by, Fae –you’ve got so many helpful posts on here! Uh, have I come to the party late and missed something? Great post, excellent ideas. But I’m not finding a download link for the spreadsheet so that I might be able to duplicate/replicate it myself. I’m a total newbie to such excel projects, so I was assuming something in this post would link to a download or template or whatever you call it. What am I missing? Gary, I’m a newbie to being able to post the file where you can get at it! Email a message to the group, and I’ll attach it in a reply. Sorry! Oh Katriena (what a beautiful name!) don’t get me sucked into Scrivener – it’s my next playtoy on my list, but I have deadlines, and if I buy it now, I’m going to play with learning it, and miss them! Do not tempt me! Thanks, Jennifer, you pulled me back from the brink of buying Scrivener that Katreina put me out on! I have to add my vote for Scrivener too (sorry, Laura!). Although, in my early writing days I did something very much like your spreadsheet. But Scrivener has taken care of many of my organizational obsessions, uh, needs. Each file (chapter/scene) has the word count continually tallied at the bottom of the screen. I’ve color coded my index cards by whose POV I’m using. Being able to move those cards around is the BEST. It may be true, though, that there isn’t a screen that shows this info all at once. I haven’t checked out all the features (and there is an outline view that may show some of this info together). I will add that while it took a bit of time to learn a lot of what Scrivener can do, you can just “start writing” by opening a file and typing into the main screen. All the rest are extras that don’t you don’t *need* to write. I encourage you to try it! But maybe not if you’re under a deadline.